August 28, 2017 – This week, our time machine takes us into Nazi-occupied France, to meet a bold patriot with a famous Uncle Charles. Her name was Genevieve de Gaulle, and she did the hard work of resistance behind enemy lines, that the general urged from exile. 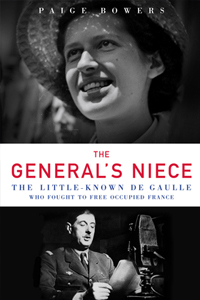 Paige Bowers tells Genevieve’s story in The General’s Niece: The Little-Known de Gaulle Who Fought to Free Occupied France. It taps a rich historical well of interviews with family members, former associates, prominent historians, and never-before-seen papers written by de Gaulle herself, exploring her relationship as confidante and daughter figure to the legendary French patriot.This week, our time machine takes us into Nazi-occupied France, to meet a bold patriot with a famous Uncle Charles. Her name was Genevieve de Gaulle, and she did the hard work of resistance behind enemy lines, that the general urged from exile. Paige Bowers tells Genevieve’s story in The General’s Niece: The Little-Known de Gaulle Who Fought to Free Occupied France . It taps a rich historical well of interviews with family members, former associates, prominent historians, and never-before-seen papers written by de Gaulle herself, exploring her relationship as confidante and daughter figure to the legendary French patriot. For more on our guest, visit PaigeBowers.com, @PaigeBowers on Twitter, or Facebook.com/PaigeBowersAuthor.